On April 5th (March 23rd old style) the Church commemorates the holy martyr Lydia. 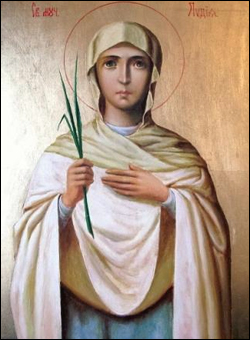 Saint Lydia, together with her husband, Philetas the Senator, and her two sons, Macedon and Theoprepius, were Christians from the city of Rome and lived during the reign of Emperor Hadrian (117-138 A.D.), a cruel persecutor of Christians. During one such persecution, Saint Lydia and her family members were seized and taken for interrogation by Hadrian. Unable to contradict the holy martyrs’ wise answers to his interrogation, Hadrian sent them to Illyria, to be tried by Amphilochius the Captain. The latter immediately ordered them to be hanged on a tree and their bodies scraped with knives, and afterwards to be thrown into prison. During the night, when the holy martyrs prayed and sang sacred hymns, an angel appeared before them and strengthened them for their forthcoming martyrdom. After learning of all this, the Emperor Hadrian, breathing wrath and fury, came from Rome to Illyria and ordered a pot filled with oil to be boiled for seven days and then the holy martyrs to be thrown into it. However, when the saints were thrown in, they remained whole and unharmed. After that the disgraced emperor returned to Rome, while the holy martyrs began to pray and thank God, and amid their prayers they gave up their souls to the Lord.